Vélo Vogue: would carefree bikers = carfree bike lanes? Can a cyclist, chic or un-chic, really be footloose and fancy-free biking on our city streets? and thereby forcing us to move to the left and into car traffic, which many would-be cyclists may not feel comfortable or empowered enough to do. Alternatively, we often confront the ominous car door, as illustrated by this clever animated gif from SF Streetsblog. solution is decades old, really: road<>parking<>buffer<>track<>sidewalk. Why, then, do we continue to create the same kind of infrastructure over and over, and not improve upon the concept? 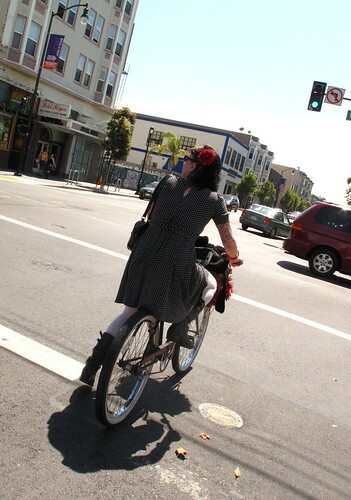 Isn't there one neighborhood in San Francisco, where drivers, residents and business owners would be cool with a brand spankin' new kind of bike lane - the kind that safely welcomes cyclists of all ages, genders and dispositions like they do in New York, Paris, Copenhagen and Amsterdam? Same thing in Portland. We occasionally try something kind of new (for here), but because it's usually so politically divisive, it's done as cheaply as possible, and therefore it's not done properly, it's incomplete, it creates an isolated section of road with some bicycle accommodation that isn't connected to anything else, and therefore it's awkward to use, nobody knows how to use it or how to drive around it, and so nobody likes it that well, and then everyone says "look, that was a failure, don't ever do that again!" Seriously! When I was in Barcelona earlier this year, I felt like I never had to leave a safe separated bike lane. And even though I don't know that city from Adam, I felt I could easily navigate because I went from one designated bike lane to another... to another! Or how 'bout something like this - cycle superhighways!!! i wish we could ride carefree here too, i have faith that one day it will happen but for now my eagle eye is always turned on for car doors, salmon joggers (joggers who run in the bike lane running towards traffic) and pedestrian sidewalk jumpers! I really think it is because the people who "plan" these lanes are trying to force us all as "far to the right as is practicable" and in "single file" as opposed to creating a new paradigm for sustainable transportation. Either that or they all apply the Spinal Tap method of street planning- think Stonehenge. Being a native-San Franciscan, I'm all for new paradigm.